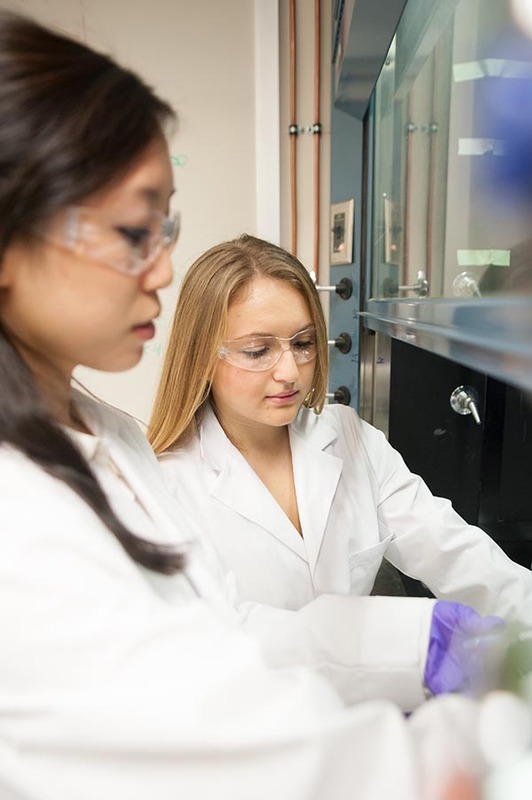 Oregon State University sophomore Talia Helman received a Johnson Scholarship Fund that enabled her to work on cutting-edge research with bioengineering faculty member Joe Baio. Her experience was made possible by Peter Johnson, ’55 ChE, and his wife Rosalie, who donated $2.4 million to the School of Chemical, Biological, and Environmental Engineering (CBEE) to endow the Peter and Rosalie Johnson Scholarship Fund. Thanks to their generosity, more than 200 CBEE students have benefited from this unique scholarship–internship program, including Talia. Read more about her time as a Johnson Intern and how the experience shaped her career goals in medicine. What is your class standing, and when do you expect to graduate? I am a sophomore and expect to graduate in spring 2016. How has being a Johnson Intern affected your academic life? I had the most incredible experience as a Johnson Intern. While working with a new bioengineering faculty, assistant professor Joe Baio, I was able to learn so much about the research process and the particular area we were studying. In Dr. Baio’s lab, we focused on protein interactions and the creation of metal oxide nanoparticles. Being a Johnson Intern has improved my critical thinking skills, not just in research but also in all aspects of my life. Even in my schoolwork, I now think like a researcher and have a more innovative way of addressing problems. I am so grateful to the Johnsons and all their hard work and dedication to this program. What got you interested in this area of research? I have always wanted to go into the medical field, and I loved the idea of engineering and medicine. It makes me really excited that there are so many people looking at ways to improve the medical field in so many different areas. I was inspired to see researchers who want to make people’s lives better. I wanted to be a part of that. I am still interested in going into the medical field because I love helping people. I love studying science and math, knowing that one day it is going to make such a difference. Going through the Johnson Internship program has only solidified my interest in medicine and research. It was incredible to see the vast array of subjects we can study and research to help the future of medicine. What has been your most influential learning experience at OSU? My most influential learning experience at OSU was the Johnson Internship. I learned a lot of skills that I wouldn’t have been able to obtain elsewhere. For example, I can now work comfortably in a lab, I know lab safety, and I am able to research other papers and design experiments. I clearly see the effort it takes to conduct research and the incredible feeling of being successful. Who has been your biggest academic inspiration? My entire family has been such an inspiration to my studies. Throughout my childhood, education was always emphasized. My parents have always encouraged me to work hard and study diligently, and they have been an unfailing source of encouragement and support. Because of them, I believe I am well prepared to follow the arduous path toward a career in medicine. I like to keep busy, so I have a variety of activities that I’m involved in outside of class. I really enjoy pottery, and I did it all throughout high school. I was so excited when I came to Oregon State because we have an incredible pottery studio at the Craft Center. I now work at the pottery studio and love it. I also really enjoy playing soccer; I am on two intramural teams in the spring. Another activity I am involved in is my sorority, Kappa Kappa Gamma. I love being a part of the house; it has brought me so many wonderful memories, inspired my studies, and provided an incredible support system. How do you balance schoolwork and outside activities? I balance my schoolwork and activities by keeping an organized planner and spending a lot of time in the library. What are your plans after graduation? Industry? Academia? Something else? After graduation, I plan to go onto medical school. After medical school, I am hoping to do a residency in orthopedic surgery. What advice do you have for someone just beginning in your field? Keep your goals in mind. It is important to stay focused on what’s ahead and keep working hard towards the future. Also, it is important to do things you love and take time away from studying to enjoy those activities.